to members of the 3-19th ADT: daily mail call. I’ll begin today’s post by first wishing all a joyous 2011. While you don’t really have “time off” per se in Afghanistan, the operations tempo of most military missions seems to at least slow a bit over the holidays. Our team, while typically not reactive in nature, is able to schedule our own missions several weeks in advance. This allowed us to take time on Christmas Day as well as New Year’s Day to communicate with our families. While I’ve failed to update this blog during our slowed mission pace, I think it’d be safe to say my other forms of outgoing communications were actually kicked into high gear over the past few weeks. With all of the different forms of modern electronics available today, I’m still convinced that nothing beats an old-fashioned, hand-written letter straight from the heart. Of course a hand-written letter involves a significant investment of time as well, especially when you factor in an average two-week shipping time frame for mail coming into Afghanistan. A few days ago I had an opportunity to perform a couple of “firsts”. You might remember my mentioning a few months ago that in addition to my role in agricultural marketing; I was also assigned additional duties such as public affairs and most interesting the position of Unit Postal Officer. 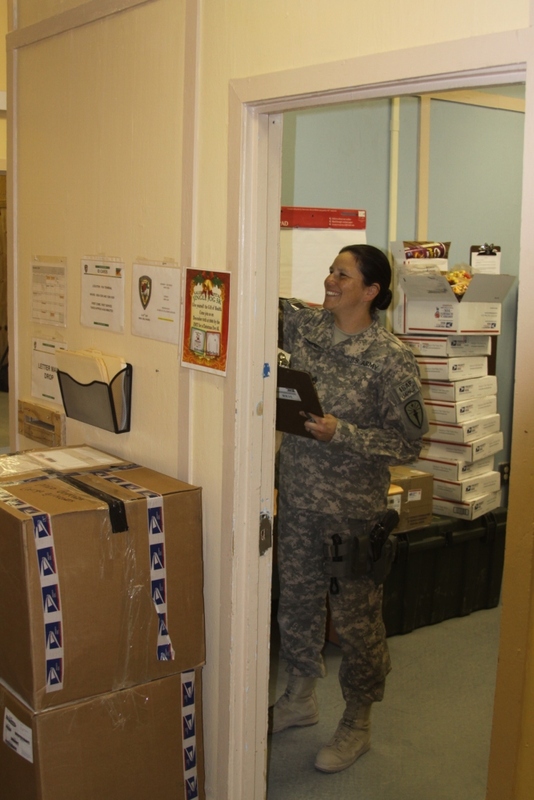 Apparently the Army requires that an officer have the title of UPO, but the day-to-day operations are carried out by other team members trained in proper mail handling procedures. As none of the other trained staff were available this past week, I thought I’d try my luck as the mailman. The first hurdle I would have to overcome on this operation to fetch the mail would be trying my luck at driving the “Bumblebee”. This bright yellow SUV is actually leased to our team and is registered in Dubai. Apparently vehicles from Dubai are factory built for mailmen- all driver controls are on the right hand side of the vehicle. Word to the wise if you ever find yourself driving such a vehicle: the turn signal is on the right-hand side as well, pedestrians waiting to cross the intersection you are attempting to signal a turn at really don’t appreciate a drive-by dowsing of windshield wiper fluid! After successfully navigating my way the entire half-mile across the FOB to the US Postal Service compound, I was about to witness first-hand the amazing support all of us troops here receive from our wonderful friends and family back on the home front. As I pulled up to the trailer containing our mail, the ADT mailbox was literally overflowing (as usual) and some boxes had to be specially marked to be picked up in an alternate location. 20 minutes and a stiff back later, I was on my way back to our ADT Headquarters with 36 letters and 17 packages thoroughly testing the limits of the Bumblebee’s suspension. In addition to physical mail, the different mediums of communications available here are literally mind-boggling. In the course of a few days, I think it would be safe to say I was able to connect with different friends and family by way of no less than five unique modes of communication including a traditional phone call via the Defense Switchboard Network, a text message through the TextFree app for iPhone, video or audio conversations through Skype (iPhone and computer), Facebook, and of course traditional email. Two other methods that I don’t personally use, but are very prevalent among our team members include a Roshan (local service) cellular phone and through Microsoft’s Xbox gaming system. I’m particularly intrigued by the xbox communication capabilities, what a wonderful way to connect with a young son or daughter. One of our team members in his early 40's had never played an xbox before; but chose to buy one immediately after hearing he could play head-to-head against his son back in Indiana while having a chance to simultaneously chat with him on a headset. As I mentioned previously, the amount of mail coming in to our team is truly a logistical marvel. 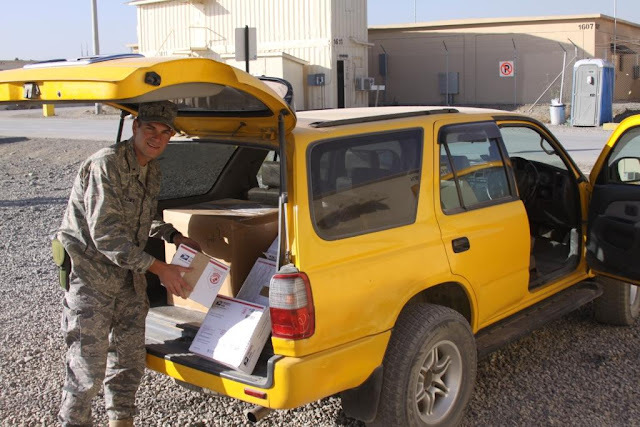 Even on Christmas Day, we were able to collect letters and packages sent from family and friends. Among the seven packages and four different Christmas cards I received on Christmas, one card stood out in particular and really inspired me to write this very communications-themed blog post. That card came from my dear grandmother, Rita Pierman, who was kind enough to type out a very thoughtful note and mail it all the way from Ottawa, Ohio. At 87 years old, she continues to inspire our family and never seems to slow down. While she doesn't use a computer, she is darn handy on a typewriter and is able to keep up to date with this blog through the help of my kind Aunt Kathy who prints off updates and delivers them to grandmother on a regular basis. You'll see in the note I've included (at the end of this post) from grandmother her mention of Skyping over Thanksgiving. For someone who has lived through all of the United States' wars and conflicts over the last eight decades, I'm sure she never dreampt she would one day be able to see a grandson serving in Afghanistan. While showing off my new artifact (the typewritten note) around the office, I began to ask some of my other team members if they could remember the last time they were the recipient of an actual typewritten note. None could remember, but it did spark another very interesting conversation- Chief Sam Rance is the rangeland manager on our team and he too was able to Skype with his grandmother over the holidays. This Skype conversation was particularly memorable for Chief and his grandmother Donna because it had been 66 years since she last communicated with a loved one in harm's way. In the winter of 1944 a historic battle we now know as the Battle of the Bulge took place. Over 75,000 Americans were killed, maimed, or captured during this battle and one of the captured was a young man from Yeoman, Indiana named Leland Julian. Technical Sgt. Julian was a combat engineer who was dating a young girl back in Indiana named Donna. As you read so often with members of the Greatest Generation, Donna and Leland's love for each other was strong enough to overcome the six month delay in postage and resulted in their marriage shortly after Leland returned home from his POW status. Two days prior to this past Christmas, Skype's global servers crashed for a few hours and judging by the morale levels around the FOB you honestly would have thought that we had lost the war. In all seriousness, the "crash" was the topic of nearly every breakfast table conversation in the dining facility that day. What would we do if the server wasn't available over Christmas? Fortunately for those of us so dependent; the Skype servers were operational within a few hours and all were able to "see" their families over the holidays. In all the advances we see in modern warfare today, I would argue confidently that communications has undoubtedly had the largest impact. As many advanced systems have done their part to reduce the fog of war, simple programs that allow troops to connect with their loved-ones back home provide a morale booster that even the finest cigar complimented by the best bottle of near beer couldn't hold a candle to. What a great and heart warming story! Thanks for sharing!